Believe me. Truly. If I can do this, SO CAN YOU! 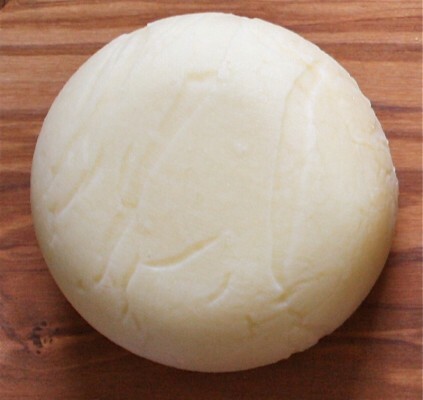 If you have made it before, we challenge you to please do it again, “Mary’s way”, link to your other gouda cheese making experiences, debriefing them all. Let us know what you think. Which recipe works best for your palate and your locality: Mary’s or the other ones you have used? 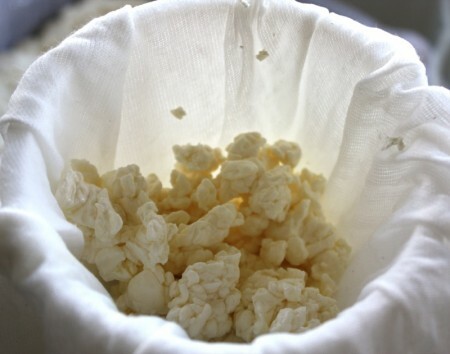 If you have never made it before, you will find that you will learn a new technique with this cheese: washing the curd! 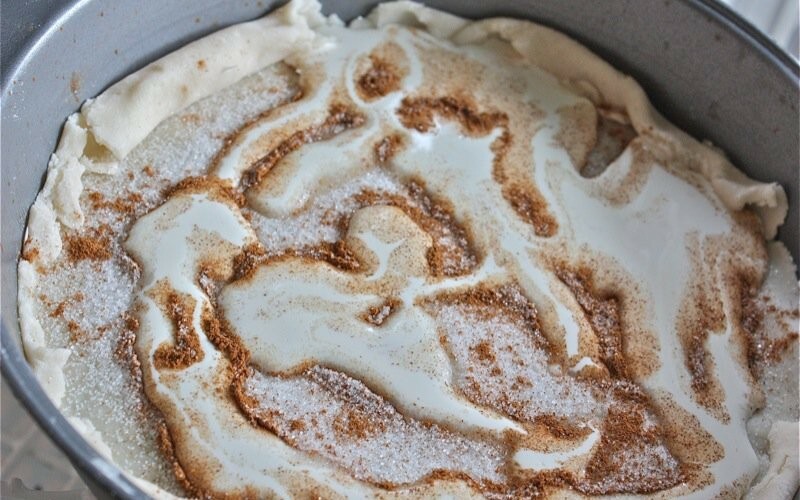 Anything new is a bit initimidating, but just read the recipe a few times and you will be able to do it! Then, take lots of photos and notes as you go, and write about your experience. 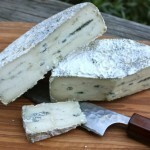 IMPT: You will need wax for this cheese, but you do have time to order it now as your cheese ages a bit before waxing. 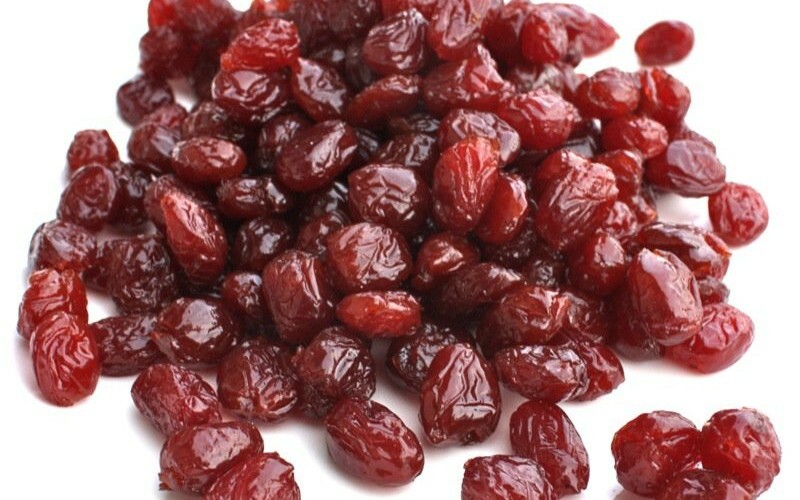 Each one can be basically eaten young, or aged to 2-3 months. 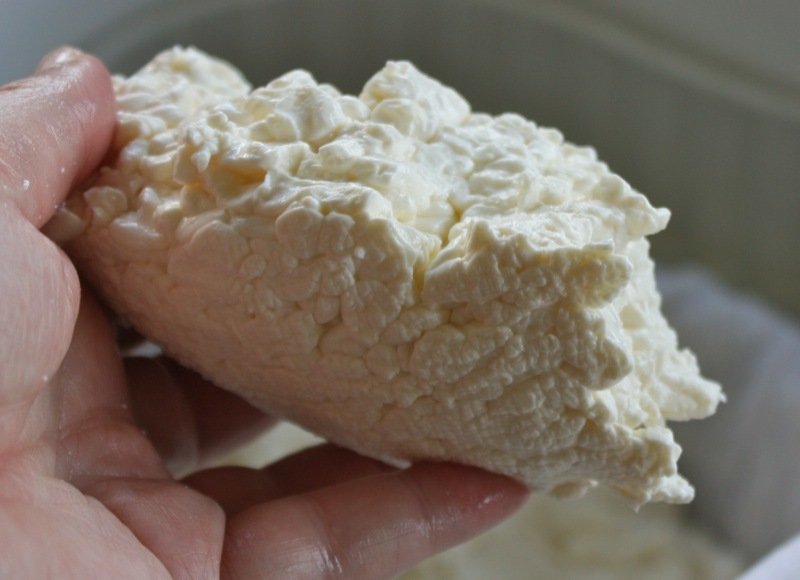 Sweet washed curd cheeses are sometimes a challenge. Addie, Deb and I got together on this day to each make our Gouda. Ian was not able, but available via phone! Phew! All three of us found this cheese to be very straight forward, and similar to all of the other cheeses we had made until the washing of the curd. 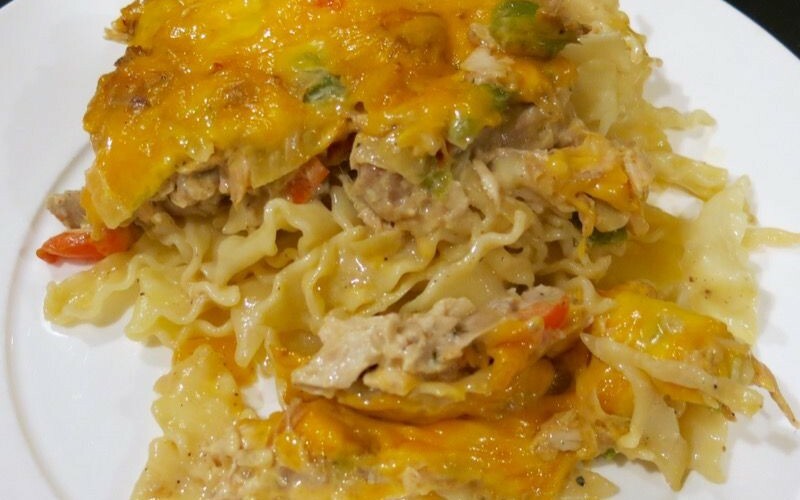 See the beautiful break in the cheese below? Cutting the curd went well, and then it rested. 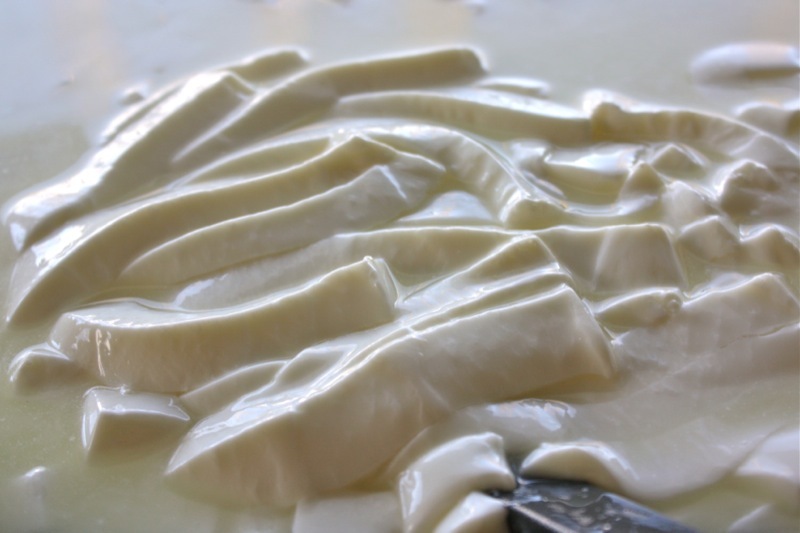 The long gelatinous columns of curd after the resting of the cut curd consistently send shivers of excitement through me. As soon we put the milk on to heat, we also put the water on to heat. 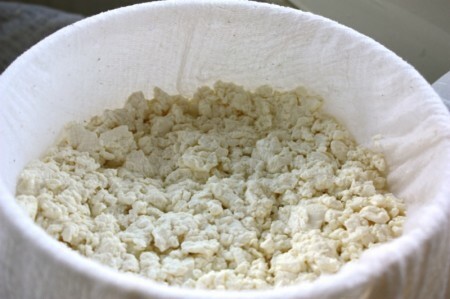 After stirring the curds for 5 minutes, and then resting them for 5 minutes, I started ladling off the whey and replacing it with an equal amount of the 140°F water until the temperature of the curd reached 92°F. 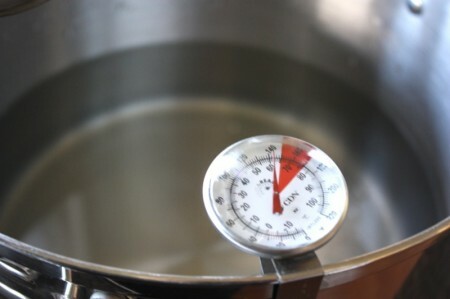 I believe it took me well over 10 cups of water to get the curd to this temperature. A lot more than two! 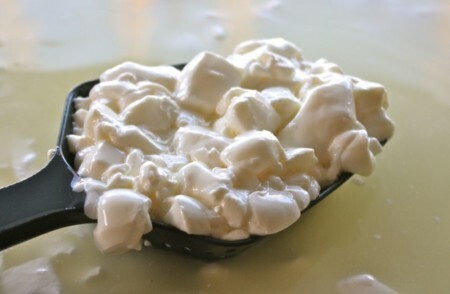 I then stirred the warmer curd for 10 minutes and let it settle again. 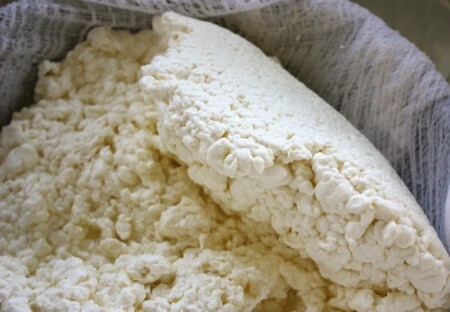 You can see, above, right how the curds look after this amount of time. Ladling off enough water to expose the curds this time, I added back the amount of 140°F water it took for the curd temperature reach 98°F which wasn’t really that much. The temperature rose quite quickly. The curds settled for 10 minutes and were to knit together. 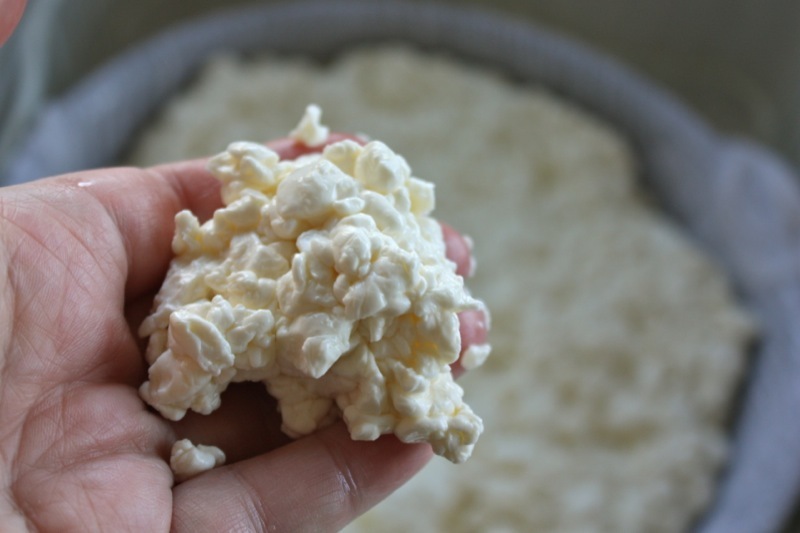 Below, left is how the curds looked before resting for 10 minutes. 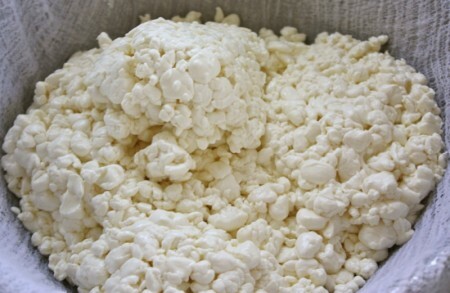 After resting for 10 minutes, you can see the curds are knitting together, to a degree and that they are much smaller and look more like the size of small beans. 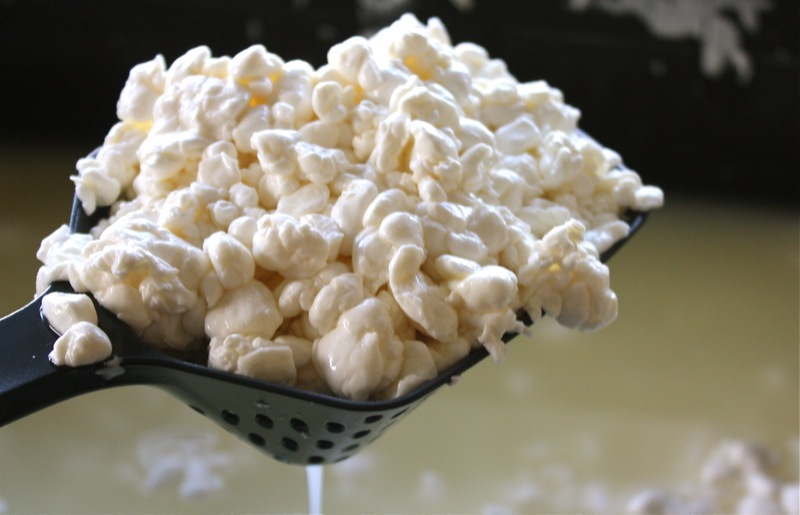 I ladled them out of the whey and into a cheese cloth covered colander. 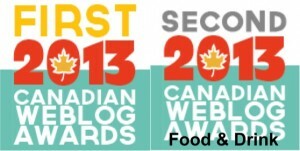 You can see, above, left, how the curds are actually knitting together. 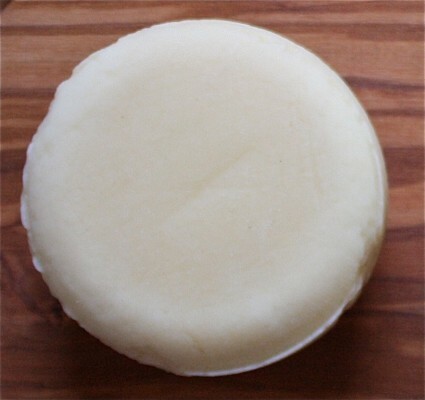 They rested for 5 minutes, and then, similar to the process of the Caerphilly at this time, I ripped shards of the curd off into one inch sections and placed them into the lined tomme mould. 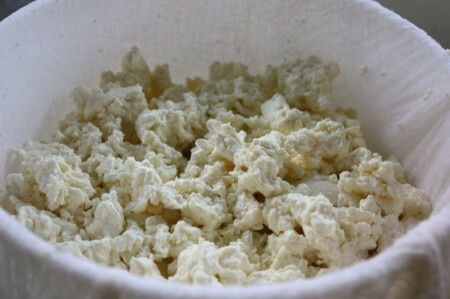 The longer the curd rested, the more knitted it became and the better tear I could get. 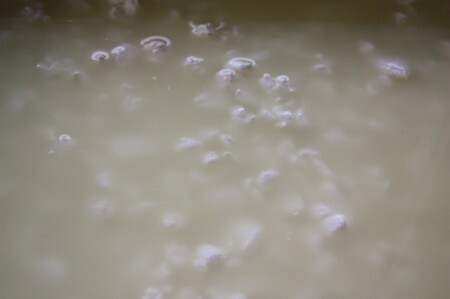 You can see the torn bits in the mould to the left, below, and I have pressed them to continue to release the whey, in the right. 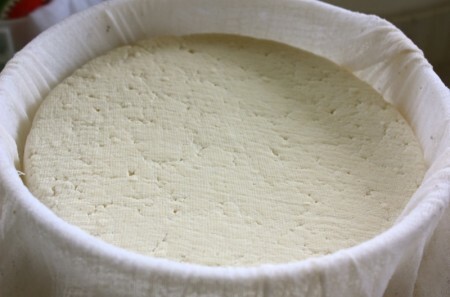 I was amazed at the why that was still draining from this curd after the resting, then the tearing and resting again. 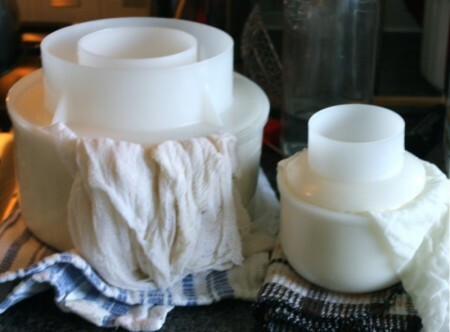 Once most of the whey was released, I sealed up the moulds and placed weights on them. 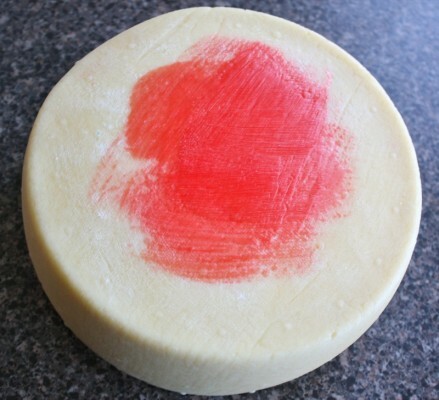 I used one tomme mould and the small 500g Gouda mould I had purchased from Glenngary to make my 2 discs. 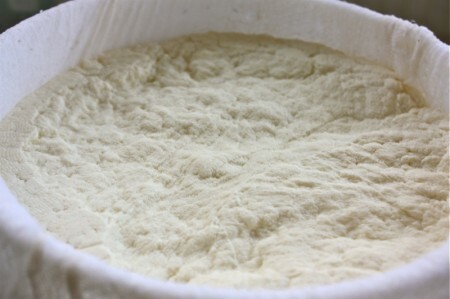 Below, left, you will see the curd after the first 30 minute press; to the right, it is turned over for the 10 hour press. 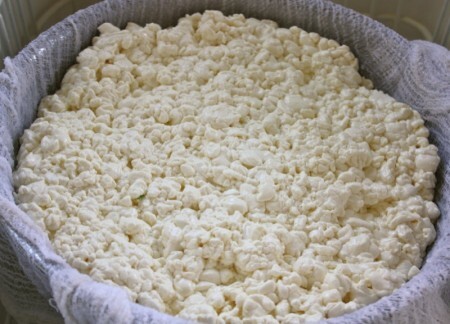 After the overnight press, the cheese came out of the moulds beautifully and went into the brine. 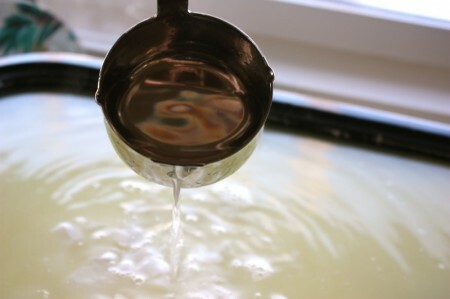 I didn’t photograph the books I used to press the cheese with, nor their time in the brine. 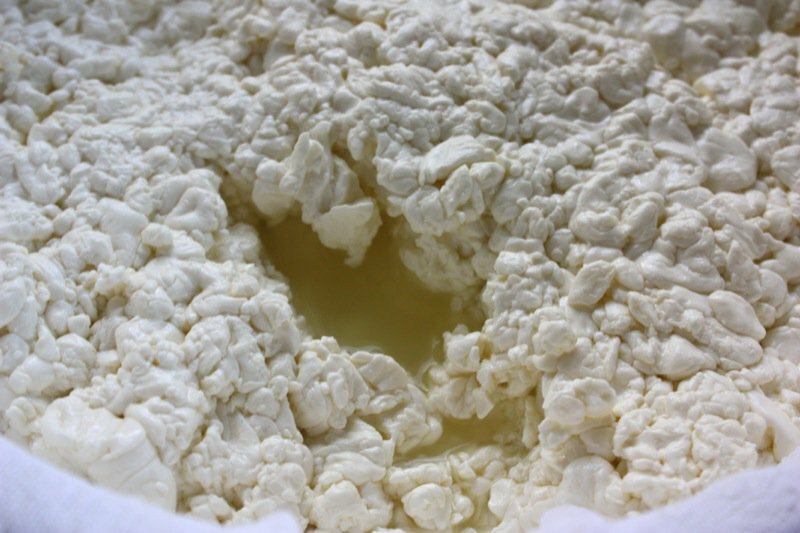 Below, right is the cheese out of the brine, beginning the air-dry process. 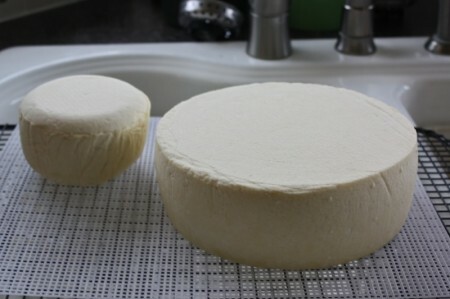 Below that, are the photos of both rounds ready for the cave after air drying; I took a photo of “right side up” and then “the other side up”. The discs are now ready for waxing. I am thrilled with their look and feel. 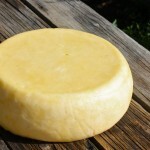 I can tell the small Gouda was probably ready for waxing a few days ago as it has much less give than the large round. 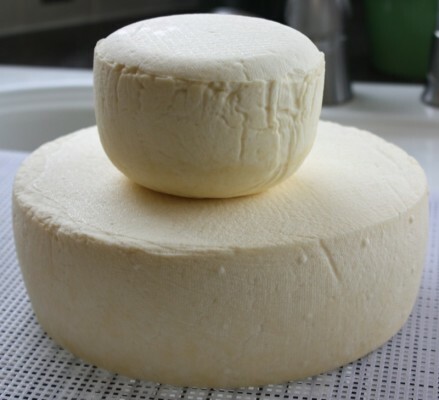 We did use the exact recipe from Mary Karlin’s Artisan Cheese Making at Home, so we will not copy that here; however, there is an important correction that you must make. This doesn’t appear on the PDF corrections on her site, but we discovered it as we were making the cheese and Addie’s i-book had different information (as is often the case) from the hard cover book. Obviously, it is easier to correct an i-book. 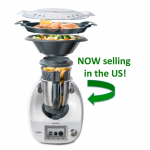 On page 95, number 3 where it reads “…add enough 110°F water to bring the curds t0 98°F…” it should read: “…add enough 140°F water to bring the curds t0 98°F…”. 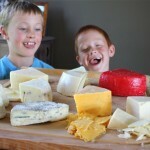 We always eat when we make cheese and the lunch was good, but the cheese sharing is always incredible. Here is the one from this day! 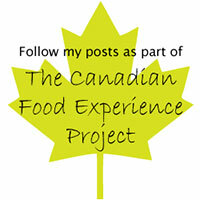 Ian has completed TWO posts for washed curd cheese! 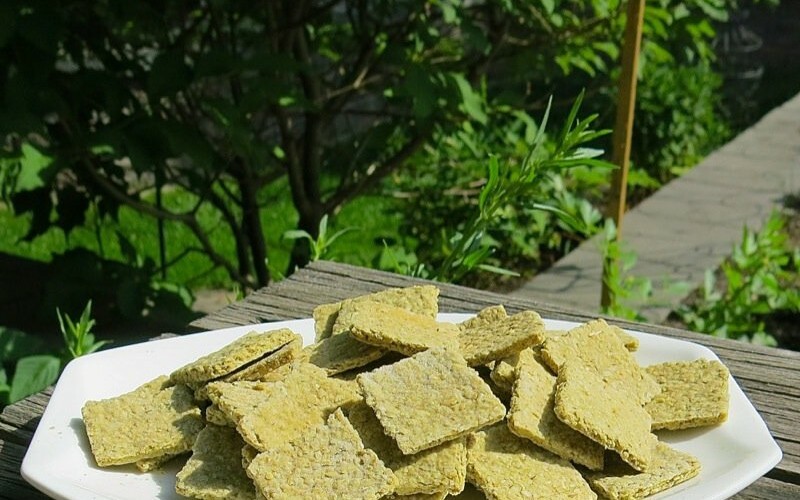 If you would rather make a Havarti made using Mary’s recipe which Ian found to be really good and revealed it here, please do! 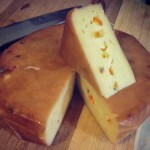 I love Havarti and cannot wait to make this one, too! 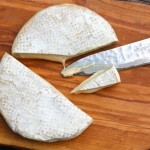 Ian’s Reader’s Choice Gouda used Gianaclis Caldwell’s recipe, and was also an incredible success! 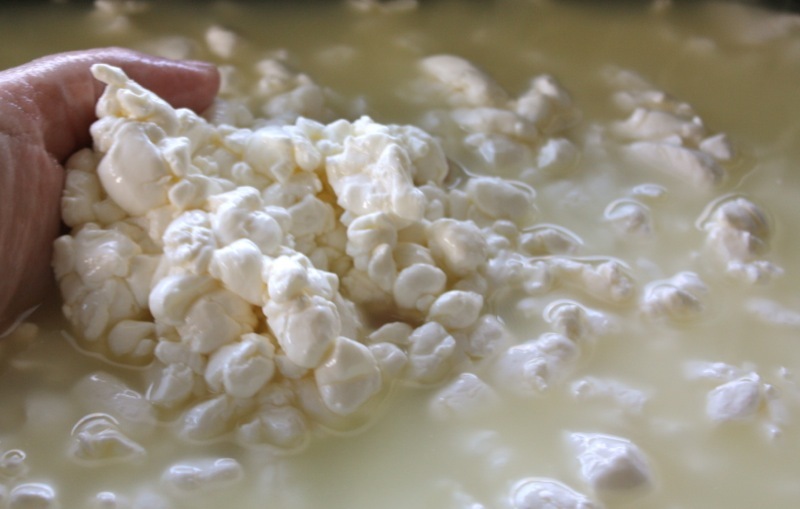 So, have fun this month, and LET”S MAKE CHEESE! 2. 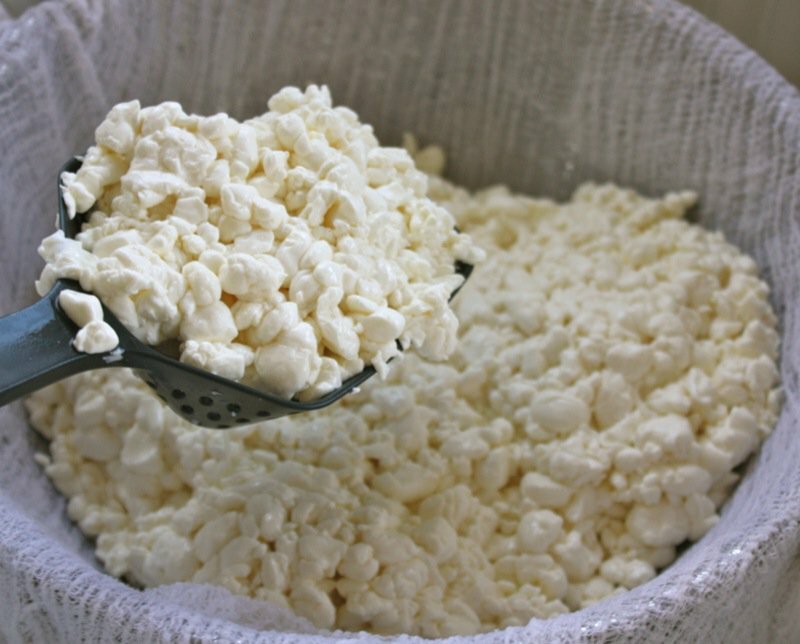 Smoky Valley Goat Cheese is offering Monthly Cheese Making Classes. If interested, lest me know in a comment below, and I will connect you with them! Love watching your cheese journey. One day soon I will follow. 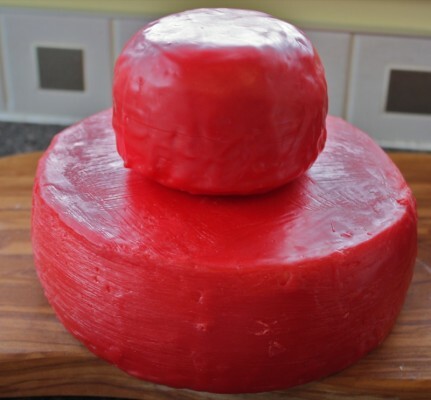 Hi Valerie, J is looking forward to this as I told him we are making a Prima Donna style cheese – one of his favourite cheeses. Quick question, it looks like you more or less doubled the recipe to 14-16 l, correct? 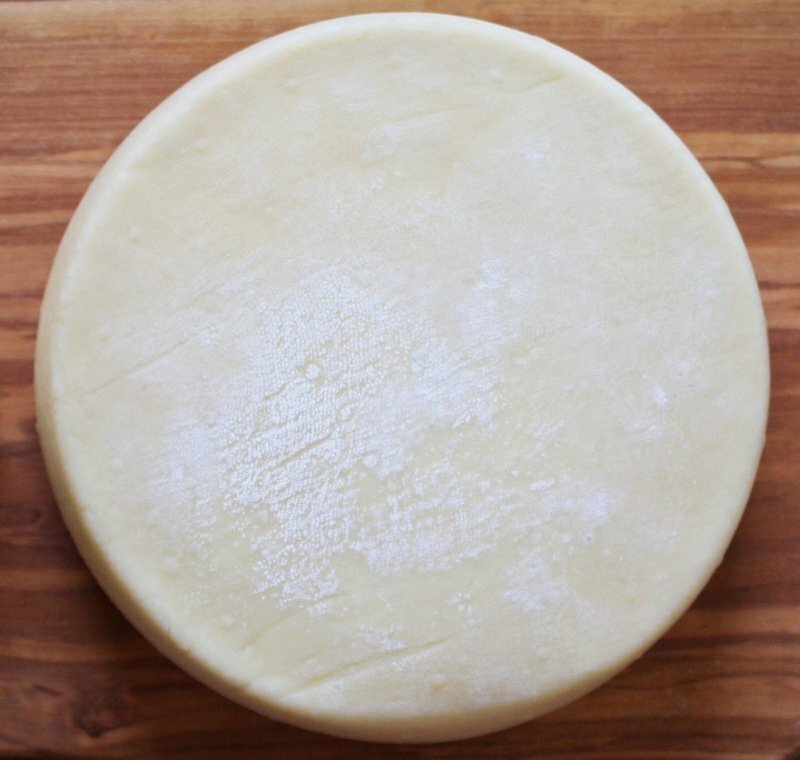 But remember you don’t scale a cheese recipe the same way you would a normal baking or cooking recipe. 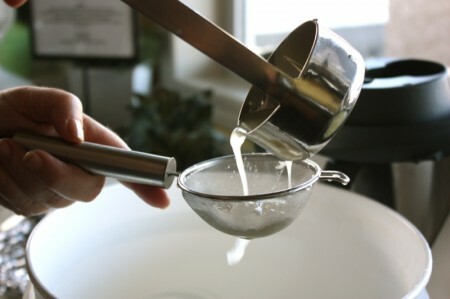 The same amount of culture should work for a larger batch or up by 1/8 tsp. Yes, I doubled the recipe exactly. My “vat” holds exactly 16 litres. Lucky me! Can’t wait to read about your cheese! Thanks! When I made the caerphilly and used the 8 inch tome mood with 8 l of milk the wheel was around 1 inch thick, which is on the thin side, so for this I wanted to have a thicker wheel. 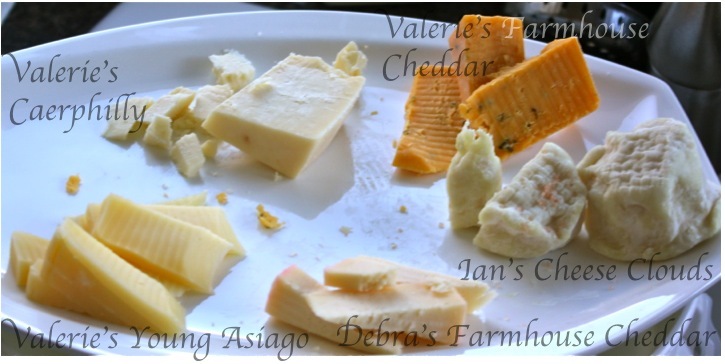 Ian – oops I doubled everything for the Asiago! 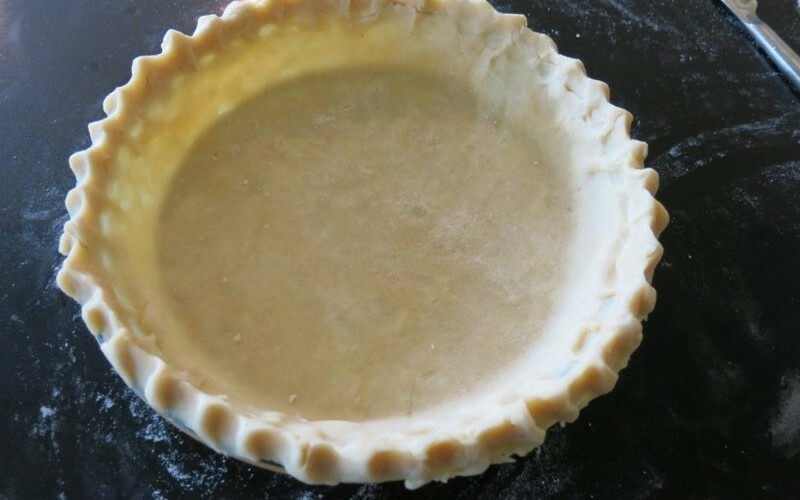 When I double the recipe – I tend to double everything – but an extra litre or two, no. I think that is another error in Mary’s book. 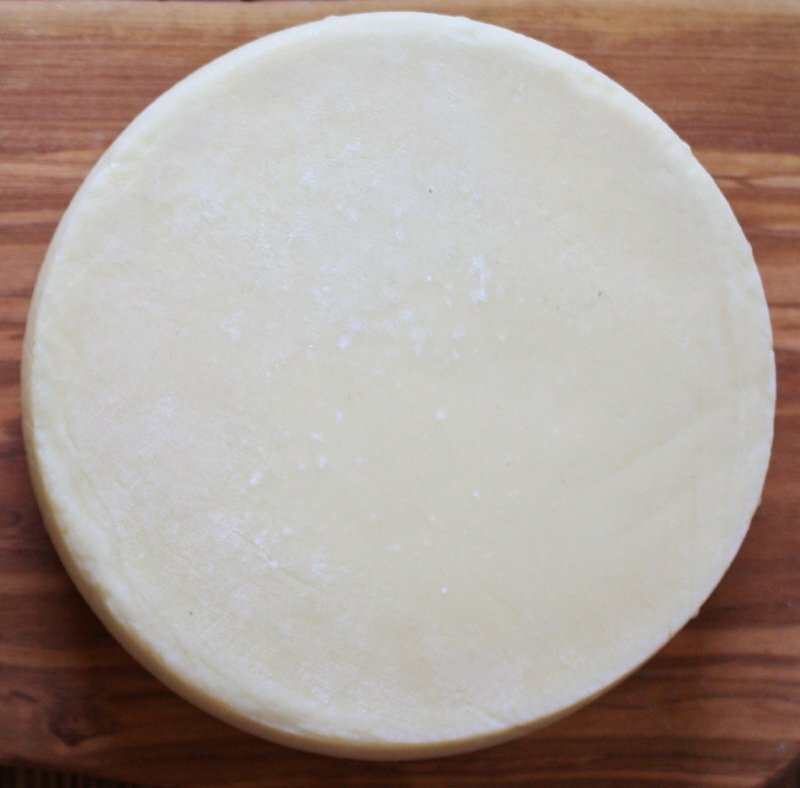 It should read a 5 inch tomme mould for the 8 litre milk recipes. The same think happened to Stephanie and Lori Anne from Clockwork Lemon. They ended up with two really thin rounds. I got the nice thick Asiago Pepato AND the smaller mould that I aged for a short while with out the Peppercorns out of my one batch. 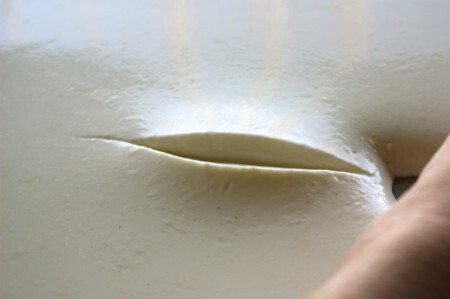 I noticed that you said you had issues with the wax drying on contact with the cheese. There are several things you can do. 2. 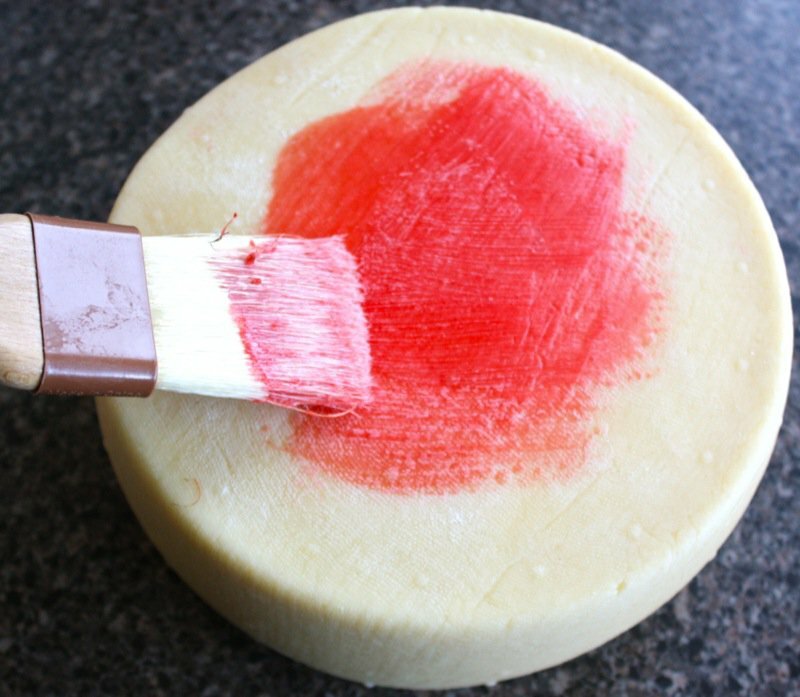 Dipping – Take your melted wax and then dip part of the cheese in the wax, let dry, then dip the other part let dry, then rotate 90 degrees and repeat. 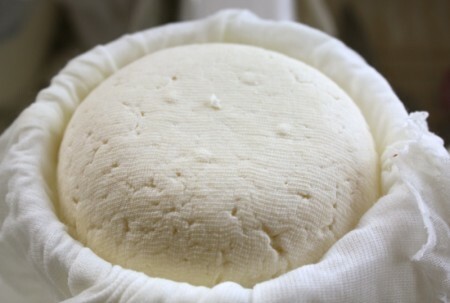 I am thrilled with my Gouda so far, but haven’t tasted it, yet! 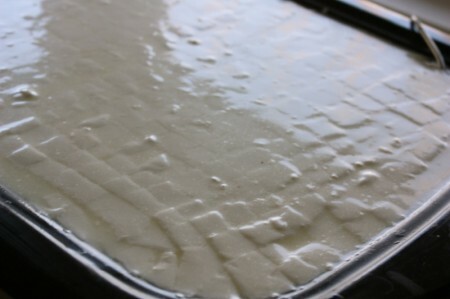 LOVE Havarti and Ian says Mary’s recipe is excellent, so that is on my “to do” list. Cannot wait to see how it comes out for you, too! Yes! So excited for this one! 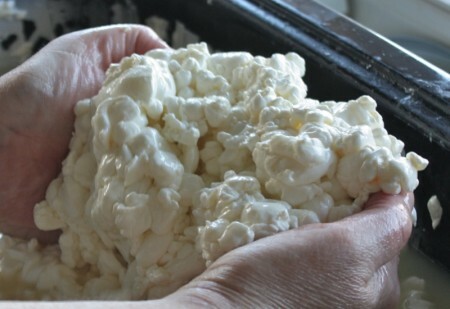 Did you make a double batch of cheese? That looks like a huge wheel. 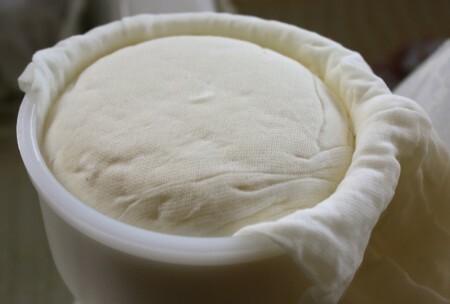 My “vat” holds 16 litres, so I always make a double batch of these aged cheeses as they take so long to age… eating the cheese is never a problem, and I can test in younger and older! oops, just read the comments and you already answered that question! You know what, I cannot recall – but what I DO know, is that it is the BIGGEST one they have with the lid. There aren’t many with the chaser or lid. 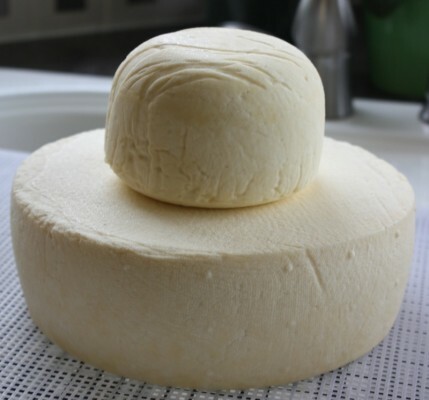 I may be wrong, but I think it is the huge Mountain Tomme mould… in any case, the biggest one with the lid. When you call to place your order, that is all you have to say. The gal on the phone is great.